"Here in Porto Alegre we will not judge [the former president] Lula, who will be tried is the Judiciary Power. It will have to tell the Brazilian people if it will continue to follow the Constitution and the legal proceedings or if it will follow Globo and issue sentences according to the Brazilian bourgeoisie's will." The statement was given by the member of the national coordination of the Landless Workers Movement (MST) João Pedro Stedile, in press conference conducted this Monday (22). The declarations were given in the camping site in defense of democracy and of Lula's rights to be candidate. A series of activities, such as readings, debates and discussion groups will take place there. The place is only 500 meters away from the Regional Federal Court of the 4th region (TRF4), where the former president's trial will happen on the 24th of January. The coordinator also informed that many caravans are to arrive in Porto Alegre coming from other states, such as Santa Catarina and Paraná, as well as other urban popular movements, which must arrive this Tuesday (23). The estimate is that around 30 thousand people be in the southern capital until Wednesday. Stedile says that, regardless of the result, Lula will be candidate by the Workers' Party (PT) to run this year's general elections: "the theme will be politically resolved, and not by the lawsuit itself." The popular leader also reminded that Lula has always been attacked by big media conglomerates that incentivated discourses, for instance, that Lula would be the owner of JBS, whose real proprietors were the brothers Joesley and Wesley Mendonça Batista. 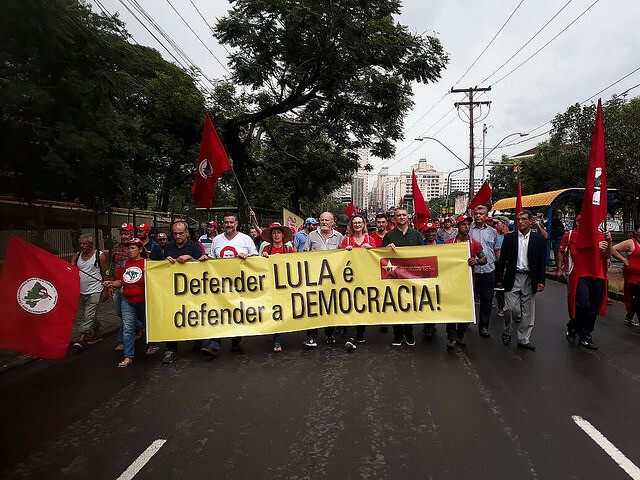 The week of fights in defense of democracy has started with the mobilization of more than 3.500 peasants marching this Monday (22) in the southern capital Porto Alegre, where the former president Lula will be tried. According to Bruno Pilon, coordinator of the Small Landowners Movement, the march was an act in defense of freedom: "What we have here is a strong, firm protest of the countryside organizations and of the Via Campesina movements, not only in defense of the possibility of Lula to be candidate, but of freedom in general. Because if an arbitrary conviction is maintained, can you imagine what will happen to our peasants who fight for land and a healthy diet?". Workers, organized by Via Campesina, international peasant organization composed by various popular movements, marched over 7 kilometers for about 3 hours. The actions, which will be take place throughout the week, aim at calling people's attention to the irregularities around the former head-of-state's trial in the lawsuit known as the "Triplex case." The former governor of Rio Grande do Sul, Olívio Dutra, also from the Workers' Party (PT), followed the march. In an interview to Brasil de Fato, he highlighted the activity's importance for political debate. "Here are peasants' caravans, landless workers, and other different segments. Citizenship is awakening and this is part of a process which we want to continue," he stated. Besides Dutra. 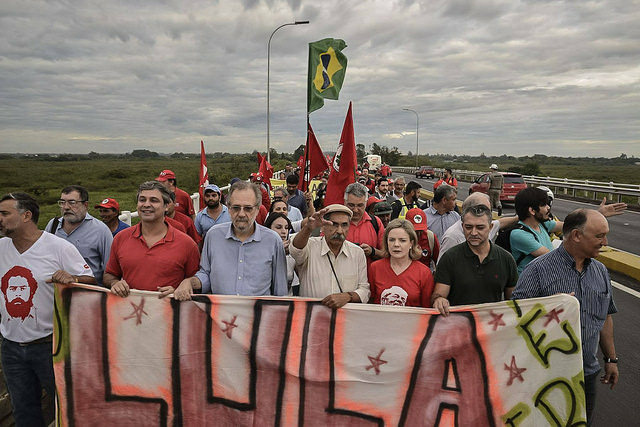 Other politicians and leaders were present in the march, such as the president of the Workers' Party (PT), Gleisi Hoffmann, and the former minister of Agrarian Development, Miguel Rosseto. The landless workers' movement (MST) was one of the popular organizations that participated in the act. According to Ildo Pereira, from the national board of the movement, the demonstration marks a historic moment for the country. "We once again march against half a dozen of bourgeois people who want to prevent the worker from choosing his or her candidate in the elections. We will not allow everything we conquered with hard work from the Brazilian people to retrocess," he declared. It was not only the rural workers and popular movements which took part in the march. The judiciary servant from Porto Alegre, Mara Weber, also participated in the fight, pointing out that "the judiciary power is not only made of people pró-coup:"
"We understand that the Judiciary power had a fundamental role within the coup, and is also being an important tool to guarantee the coup today, in this second stage, which is by preventing Lula from running. Porto Alegre understands that this week will be part of History and that we are writing History here," she stated. The march began around 7 am, from Ponte da Guaíba, Porto Alegre's metropolitan area, going through the most important avenues of the city until the Amphitheater Pôr-do-Sol, where the popular movements' camping site was established.